People were much more likely to shoot Muslim-looking characters - men or women - even if they were carrying an innocent item instead of a weapon, the researchers found. Unkelbach largely blames one-sided media portrayals for the bias. The results would almost certainly be the same if this study was conducted in Canada, says Mohamed Elmasry, national president of the Canadian Islamic Congress. "I'm hoping that Canadian Muslims one day become invisible," says Elmasry. "As such, Canadians will treat them like any others." Islamophobia - "latent" before 9/11 - is on the rise, he says, but there is very little research on the issue in Canada. The new study "does confirm our biggest fear that there is discrimination and prejudice within our society, and unfortunately people don't recognize it or don't admit it," says Salam Elmenyawi, president of the Muslim Council of Montreal. "Sometimes they really don't know that it does exist." Beyond a turban or hijab, someone's name, skin colour or a long beard may also identify them as a Muslim and make them a target of prejudice, he says. Elmenyawi wears a head-covering and long beard and says he struggles between recognizing that negative stereotypes exist and not becoming "paranoid" that he might fall prey to them. In fact, the Australian study, which will be published in an upcoming issue of the Journal of Experimental Social Psychology, confirmed that people don't even realize they hold these biased views. When the true intention of the experiment was revealed, Unkelbach says participants insisted they were not prejudiced and must have reacted differently from everyone else. "The most common response was, 'I'm sure I didn't show that effect,'" he says. "They're uncomfortable and I believe them - people are not doing this willingly. If they could, they would control that. Here, people are almost the victims of what they are fed by their environment." A quick sampling of news items related to Muslims and the Middle East confirmed this, he says, with a focus on violence and terrorism almost obliterating more balanced stories about the culture and people. "If everything about Middle Easterners is associated with terrorism, people tend to form stereotypes in their head," confirms Rima Wilkes, a sociology professor studying media at the University of British Columbia. The federal government is accusing a North Texas company of religious discrimination. This occurred after the company allegedly refused to hire a man based on his appearance. The government wants a judge to order the company to change its hiring practices. It's also seeking back pay, pain and suffering, and punitive damages for Sukhdev Singh-Brar. He is a certified security officer in the Dallas area. But before he was hired at his current job, he applied to the Champion National Security Firm in Richardson back in October 2005. "When I finished applying, she called me for an interview, and told me, 'I'm going to hire you,' but you have to shave and take off your turban,'" he said. Singh-Brar says he told the representative what she was saying was against federal law and his religion. "I cannot cut my hair. I cannot take off my turban," he said. "She told me, 'This is our company policy and we cannot change our company policy.'" In the Sikh faith, maintaining a beard is an act of commitment and acceptance of God's will. The turban signifies sovereignty. The Equal Employment Opportunity Commission sued the company last week. "Essentially, they're asking, demanding someone give up their deeply held religious beliefs for a job. In that regard, I think it's very egregious," said Bill Backhaus, EEOC. Before the EEOC filed the lawsuit against Champion National Security, it tried to resolve the case. But the government says the company wouldn't budge. A company attorney says they haven't seen the lawsuit yet. But he says they don't discriminate, and have a good track record of hiring a diverse workforce. Since the September 11 terror attacks, the government says there have been more than one thousand cases involving people originally from the Mid-East or Southeast Asia. Protesting two recent attacks against Sikh public school students, hundreds of Sikhs, in an action organized by the Sikh Coalition and the victims’ parents, marched through Richmond Hill, the heart of the Sikh community in New York. The protest covered a distance of 11 blocks, from the Sikh Cultural Society to Richmond High School, where one of the attacks took place earlier this month. Traditionally, both Sikh men and women do not cut their hair for religious reasons (though that has changed in India over the last several decades). There have been at least three reports of haircutting attacks against Sikh students in public schools in the last two years. * On June 3, Jagmohan Singh Premi was injured after being punched in the face when another student intentionally attempted to remove his patka, a small turban, at Richmond Hill High School. He suffered a facial contusion and a possible orbital fracture of his left eye as a result of the attack, the coalition said. This attack triggered a meeting with Joel Klein, the school chancellor, who promised to create a policy to better track bias attacks. * In May 2007, Vacher Harpal, then 15, was forced into a bathroom at Newtown High School in Elmhurst where his turban was torn off and his hair cut. Umair Ahmed, 17, was found guilty of the bias attack in March. The coalition issued a report called “Making Our Voices Heard: A Civil Rights Agenda for New York City’s Sikhs“[pdf] earlier this year that estimated that some 60 percent of Sikh students had been the victims of harassment or violence as a result of their Sikh identity. The coalition wants the Department of Education to train teachers on the particular dangers faced by Sikh students. Some claims of hate crimes against Sikhs, however, have turned out to be false. In Lodi, N.J. in 2004, two Sikh teenagers who told the police they were attacked by five men who yanked off their turbans and cut off their hair fabricated the story to hide the fact that they had cut their own hair, according to the police. Barack Obama spoke at the Apostolic Church of God in Chicago on Fathers’ Day. Mr. Obama has visited churches and synagogues, but he has yet to appear at a single mosque. Mr. Ellison believed that Mr. Obama’s message of unity resonated deeply with American Muslims. He volunteered to speak on Mr. Obama’s behalf at a mosque in Cedar Rapids, one of the nation’s oldest Muslim enclaves. But before the rally could take place, aides to Mr. Obama asked Mr. Ellison to cancel the trip because it might stir controversy. Another aide appeared at Mr. Ellison’s Washington office to explain. With the help of his family, Meetpal Singh fought to live for twenty months after he was shot five times inside the corner store he owned in Evanston. He came here from India 20 years ago, a member of the Sikh religion, with a philosophy of hard work honesty and equality. That's how he treated his customers. Local 12's Deborah Dixon tells us he died wondering why the last customer in his store shot him. On October 14th, 2006, Meetpal Singh called 911 from inside the Blair Market after he was shot five times. A security camera recorded the violence. Now, nearly 20 months later Singh is dead. His body could no longer fight the effects of the bullets. Old customers at the market passed out reward flyers for what is now...murder. While Meet Singh was being shot inside eyewitnesses say a lookout stood at Woodburn and Blair. Then they both got into a dull green Camaro. "My father would have wanted to know why what is the reason for this." Until now, the Singh family thought little of the shooter, focusing more on caring for Meetpal. He was at home the past 8 months. For years, Germany's legal experts have been arguing about whether Muslim public officials have the right to wear headscarves. The issue raises difficult questions about religious tolerance and constitutional rights in Germany. Head scarves go before the court. What are the limits of modern German tolerance? "When you do something," Brigitte Weiss says, "you need to do it right." It's a motto she knows from home. She remembers people saying it where she comes from, a coal-mining area in Germany's western Ruhr region. Later, as a grade school teacher in Mettmann, a small town near Düsseldorf, she tried to pass the homespun wisdom on to her students. Whether it was their homework in German, geography, home economics, or whatever else they were doing -- the main thing was to do it right. "All of my students," Weiss says, "were happy to have me as their teacher." Now this is no longer entirely the case. The reason is Brigitte Weiss's conversion to Islam. Now she has a new name, Maryam, and she dresses differently: She wears a headscarf. The problem is that for nearly two years it has been against the rules for teachers in the state of North Rhine-Westphalia to wear headscarves in public schools. So Weiss has received a letter from the schools administration asking to know why she wore hers. Yes, why? "Because I'm a Muslim," she says. But what does wearing the headscarf mean? Is it obedience to religion? Or submission to a man? Or is it a rebellion against the society shaped by Germany's post-war constitution? Nonsense, says Maryam Brigitte Weiss. For her, wearing a headscarf is something "typically German, 100 percent German" -- just like herself. At home, at school, or as a Muslim, she applies the same rule -- no half measures. "Whenever I do something, I do it right, dotting all the i's and crossing all the t's." Sen. Barack Obama has personally apologized to two Muslim women who were kept from sitting behind the podium during his rally in Detroit this week because they wore head scarves. Hebba Aref and Shimaa Abdelfadeel said in a joint e-mail statement Thursday that they are grateful and ready to move forward after each receiving calls from the senator. In his own statement, Obama said he expressed his deepest apologies to the women Thursday. THREE Sikh students have been expelled from a French school for refusing to remove turbans. It was the first time Sikhs were forced out under a new French law banning conspicuous religious signs and apparel in the classroom, their lawyer said. teenagers at disciplinary hearings ordered by a court, said lawyer Felix de Belloy. The ruling was the latest twist in France’s effort to apply a new law banning religious symbols at public schools. The ban, which includes Islamic headscarves, Jewish skullcaps and large Christian crosses, took effect at the start of the school year. At least eight Muslim girls have been expelled under the law. Islamic headscarves were its main target because of concerns that growing Muslim fundamentalism in France was weakening the nation’s secular roots. Turbans were not a focus of the debate over the measure, but Sikhs later learned the head covering would also be outlawed. The Sikh boys had been suspended since September 23 pending this week’s disciplinary hearings. A court last month ordered the hearings to decide the fate of the boys, who had been confined to classes in a cafeteria, apart from other students, since the start of the school year. Sikhs had asked the court to force school officials to take action by either accepting or expelling the boys. The Sikh students had made a concession by agreeing to wear a "keski" - a smaller version of the full turban, but the disciplinary panel did not accept that offer, de Belloy said. "I think school officials are a bit afraid that if they admit the Sikhs, then young Muslim girls would say it’s unfair," he said. "It’s not a big surprise." To wear a turban in America — even in a state that has absorbed as many waves of immigration as New Jersey has — is to subject yourself to judgment by strangers, not all of whom have warm and fuzzy feelings about diversity. 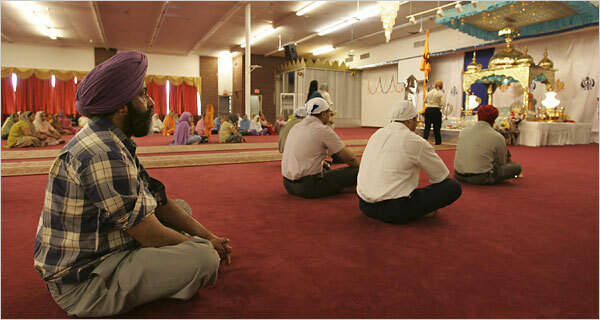 Muslims have absorbed much discrimination in the United States in recent years, but also caught in the crossfire have been Sikhs, members of a religious minority from India whose men happen to wear a similar head covering, and who have endured similar suspicions since the terrorist attacks and the subsequent wars in Iraq and Afghanistan. A University of South Florida student said Walt Disney Co. officials told him he didn't fit the "Disney look" when he applied for a job. Now, 24-year-old Sukhbir Channa is suing Disney World. He claims the company discriminated against him because of his turban and bushy beard, which his religion requires. He was applying to be a trumpet player during the 2006 holiday season. A Disney spokeswoman said they have no record of Channa applying for the job then and that the company does not discriminate against anyone. The Supreme Court said Monday it will decide whether former Attorney General John Ashcroft and FBI Director Robert Mueller must face a lawsuit that claims prisoners detained after Sept. 11 were abused because of their religion and ethnicity. The case, to be argued around the end of the year, will help determine when Cabinet officers and other high-ranking officials can be sued when lower-level government workers violate people's civil rights. The lawsuit was filed by Javaid Iqbal, a Pakistani Muslim who spent nearly six months in solitary confinement in New York in 2002. Iqbal, since deported from the United States, says Ashcroft, Mueller and others implemented a policy of confining detainees in highly restrictive conditions because of their religious beliefs and race. A federal appeals court said the lawsuit could proceed, but the Bush administration said the high-ranking officials should not have to answer for the allegedly discriminatory acts of subordinates, absent a glimmer of evidence that they intended or condoned the harsh treatment. The New York-based 2d U.S. Circuit Court of Appeals said that Ashcroft, Mueller and 32 other former and current government employees named in the lawsuit may eventually be dismissed as defendants if evidence shows they were not sufficiently involved in the activities to support a finding of personal liability. Walt Disney World is being sued by a former employee who says he was terminated for having a "non-Disney look," according to the Tampa Bay Business Journal. In the suit, filed in Hillsborough County, Former USF student Sukhbir Channa says he was hired as a seasonal college musician in October 2005, requiring his appearance in parades and atmospheric performances. Channa, 24, wears a turban, beard, and keeps his hair long for his Sikh religion. In the parade peformances, he wore a toy soldier hat that covered his head. In the atmospheric performances, he was initially allowed to wear a red turban in place of the red beret other musicians wore. According to the suit, Channa was removed from the position because he lacked the “Disney look”. Channa says he complained to human resources, who told him he was never hired for the atmospheric position. But Channa says he received training for the position, but no corrective action was ever directed at him regarding his appearance. He claims he was terminated in early 2006 for not having the "Disney look." When he applied to be re-hired later that same year, he says he was denied employment for the same reason, while all of his former co-workers were rehired. The lawsuit also claims Channa was singled out to do menial tasks by his supervisor. Channa's attorney says the Florida Civil Rights Act is being violated and is requesting damages for his client totalling at least $1 million. A Muslim woman was awarded £4,000 yesterday after the owner of a hair salon refused to employ her because she wears a headscarf. Bushra Noah, 19, who has been rejected for 25 hairdressing jobs, had accused Sarah Desrosiers of religious discrimination after she failed to offer her a position in May last year. Ms Desrosiers, 32, said she needed staff to display their hairstyles to customers at the Wedge salon in King’s Cross, North London. A panel at the Central London employment tribunal dismissed a claim of direct discrimination but upheld a complaint of indirect discrimination. A Broward County resident has sued Walt Disney World, claiming he was discriminated against because his religion prevents him from conforming to the Disney dress code. Miami Attorney Matt Sarelson filed the suit in Hillsborough County Circuit Court on behalf of Sukhbir Channa. Channa, 24, is a practicing Sikh who wears a turban, a beard and keeps his hair long in accordance with his religious beliefs. In his suit, Channa says he was hired in October 2005 as a seasonal college musician, which requires parade and atmospheric performances. At the time, he was a student University of South Florida. In his parade performances, Channa says he wore a toy soldier hat to cover his head. In the atmospheric performances, he was initially allowed to wear a red turban in place of the red beret the other musicians wore. However, even after rehearsing for both jobs, the lawsuit claims Channa was removed from the atmospheric position because he lacked the "Disney look." According to the suit, Channa complained to human resources and was told he was never hired for the atmospheric position and no corrective action was ever taken. The suit also claims he was singled out to perform menial tasks for his supervisor. Channa was terminated in early 2006 for not having the "Disney look," the suit says, and when he applied to be rehired October 2006, he was denied for the same reason. According to the suit, all of Channa's former co-workers who wanted to be rehired were. The suit alleges that Disney is violating the Florida Civil Rights Act, and requests damages of at least $1 million and that the court enjoin Disney from discriminating against Sikh employees and prospective employees. The family of a Sikh girl excluded from school for wearing a religious bangle have asked the prime minister to intervene in the matter. 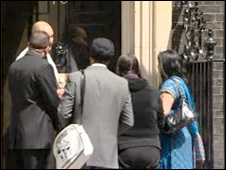 Sarika Singh, 14, and her family delivered a petition to No 10 Downing Street signed by Sikh organisations. The teenager has been excluded from Aberdare Girls' School since November 2007 for wearing a Kara bangle. A High Court case in London next week, challenging the school's decision, is expected to take three days. The petition was signed by 150 Gurdwaras, Sikh meeting places, and other Sikh organisations as well as more than 70 non-Sikh bodies, including civil liberty and anti-racist groups and trade unions. Blair's ex-chief legal adviser Lord Goldsmith and Britain's current chief prosecutor Ken Macdonald are among key officials who insist new police powers are unnecessary. Goldsmith said the proposals could strain relations with Britain's Muslim communities and choke off a vital flow of intelligence to police. This was not a case of boys will be boys. The student who assaulted Sikh student Jagmohan Singh Premi, 18, last week at Richmond Hill High School in Queens was not playing games. Premi's attacker wasn't just horsing around. He punched him in the face while holding a key between his knuckles, inflicting an orbital fracture and bruising. Sikhs have no doubt it was a hate crime. Certainly, it was no child's play. "I am sad this is happening in America; I want to go to school to learn," said Premi, a shy, serious young man who wears the turban his religion prescribes for all Sikh men. The physical assault came after the attacker tried to rip off Premi's turban while he was sitting in class and, even more egregious, with the teacher in the room. According to Amardeep Singh, executive director of the Sikh Coalition, the harassment did not begin last week. "Jagmohan's tormentor has a long, documented history of harassing him in school, making fun of his patka [turban] and beard, and attempting to pull off his patka," Singh said. Actually, the attacker had been suspended this year for trying to remove the Sikh teen's turban. But after he came back to school, the harassment continued unabated. Seven years ago; sporting a Sikh turban could get you killed, as was Balbir Singh Sodhi, a gas station owner who was shot Sept. 15, 2001 in Mesa, Ariz., after his murderer mistook him for a Muslim. Today, the trademark black head covering sported by male members of the Sikh religion can get you into the heights of mens' fashion. Such is what happened to Sandeep Singh "Sonny" Caberwal, 29, a graduate of Duke University and Georgetown Law School who on a whim, it seems, decided to take on a most unusual assignment: Modeling mens clothing to make a point about diversity. Mr. Caberwal . . . grew up in rural Ashboro, N.C. as the son of a doctor and the wearer of a turban ever since he was a small child. His family is from Punjab, India. He has never cut his hair, as all Sikh men have been required to have long hair since 1699. It is always covered by a skull cap and turban. Some time ago - he does not know when - Kenneth Cole, founder of a clothing line by the same name - got an idea for an advertising campaign on breaking stereotypes - and plugging clothing. Mr. Cole hired a casting agency to find a male Sikh willing to be a model. The man had to be American-born, highly educated and articulate. There being no candidates on the usual lists, the agency began calling up national Sikh-rights organizations and Mr. Caberwal heard Cole was looking. One thing led to another and last October, he found himself in New York posing in some pretty spiffy clothes along with that turban. New York City Schools Chancellor Joel I. Klein vowed that he “won’t tolerate any harassment based on race, religion, or gender in our schools,” following last week’s arrest of a 15-year-old Asian student for assault on an 18-year-old Sikh classmate at Richmond Hill High School. The assailant allegedly punched his classmate with a key held between his knuckles during class on Tuesday, June 3 according to reports. The 15-year-old was arrested by the hate crimes division of the New York Police Department (NYPD) and charged with assault in the second degree and harassment, according NYPD officials. Before the attack, he apparently tried to untie the patka (small turban) of the 18-year-old Sikh student, Jagmohan Singh Premi, according to the Sikh Coalition. When Premi tried to fix his patka, the suspect reportedly punched him in the face. Premi suffered a facial contusion and a possible orbital fracture of his left eye as a result of the attack. Five years after launching a human-rights complaint against oilsands giant Syncrude Canada, a devout Sikh man who refused to shave his beard for work has won the right to have his full case heard. A ruling released Tuesday by the Alberta Court of Appeal clears the way for electrician Devinder Wadhwa to have his overdue hearing before the provincial Human Rights and Citizenship Commission. "The legislative scheme must be read to further the goal of speedy and inexpensive resolution of human-rights complaints," Court of Appeal Justice Ronald Berger wrote on behalf of the three-member panel. "(Syncrude's) appeal . . . was premature." Wadhwa was working as an electrician in 2003 when he arrived on the Syncrude work site in Fort McMurray, Alta., which is about 430 kilometres north of Edmonton. A lawsuit brought by four former New Mexico State football players alleging they endured religious discrimination because they are Muslim was settled for $165,000, court records show. The federal lawsuit was filed by the American Civil Liberties Union on behalf of Mu'Ammar Ali, Jacob Wallace and brothers Anthony and Vincent Thompson. The case was settled days before it was scheduled to go to trail last June 18. The settlement was paid by the state's risk management division. Both parties had agreed to keep the settlement amount confidential for six months. Defendants in the lawsuit were NMSU football coach Hal Mumme, university vice president and provost William Flores and the school's regents. The lawsuit contended that Mumme instituted a "religious brotherhood" within the team, singled out Muslim athletes and had players recite the Lord's Prayer after each practice and before each game. Hundreds of headscarved women protested Friday against a court ruling to cancel a reform which would have allowed students to wear the Muslim garment at university. About 500 women demonstrated in the southeastern city of Diyarbakır after Friday prayers, and hundreds more in colourful headscarves chanted slogans in Istanbul. A Queens teen convicted of bias for cutting the hair of a Sikh schoolmate ducked jail time on Thursday in exchange for a year of community service and an essay for the judge. Acting Queens Supreme Court Justice Joel Blumenfeld ordered Umair Ahmed, 19, to complete 180 hours of community service and write about what he'd learned since his attack on 16-year-old Harpal Vacher. Based on Ahmed's conduct in the next year, Blumenfeld will decide next June whether to put him behind bars. "What you did was incredibly stupid," Blumenfeld told Ahmed. "Incarceration just can't be the only answer. For this next year, the threat of jail hangs over your head." "The whole thing was a disgrace. It just wasn't an appropriate sentence," said Prabhjot Narula of United Sikhs, an advocacy group that accompanied a devastated Harpal from the courthouse. "For a hate crime, it was a slap on the wrist." A student in Queens was attacking by a classmate this week, and it could be bias crime. The photo above was taken of Jagmohan Singh Premi the day after the attack. Critics say Richmond Hill High School has a problem. They say Sikh students are routinely harassed and that the Department of Education needs to do more about it. What happened on Tuesday, they say, is only the latest incident. Premi says it went on for months, from taunting to harassment at the hands of a fellow student. He says he was punched in the eye after the student tried to remove his turban. It happened at his ESL class, where he had been trying to learn English. "I am sad this could happen in America," he told reporters. "I need my school to protect me." Jagmohan is one of thousands of New Yorkers who practice Sikhism, an Indian religion that forbids men to shave or cut their hair, which must be worn in a turban. Jagmohan, a student at Richmond Hill High School in Queens, New York, was sitting in class when a student partially untied his patka. With his patka untied --- and with his teacher in the classroom --- Jagmohan tried to quickly secure it. At that moment Jagmohan's tormentor punched him in the face with a key between his knuckles. Last week, a Sikh American family in Albuquerque, New Mexico awoke to find their vehicle had been defaced in an act of racist vandalism. Additionally, in a phone conversation with SALDEF, the family feels they have been victim to at least two previous bias crimes. Both of the previous incidents involved a single white male between the age of 20 and 30 shouting at the couple and in one case involved an alleged physical attack with the man throwing stones at Mr. Singh. A call centre worker has been awarded more than 22,000 pounds after winning a race and religious discrimination case against a company owned by entrepreneur and Rangers chairman Sir David Murray. Lipka was awarded 15,000 pounds for injury to his feelings, an additional 3,750 pounds as the company had failed to follow the statutory grievance procedure, and 3,718 pounds in interest. James Lipka (58), who worked for the Student Loans Company and Rangers Projects from Glasgow-based Response Handling's call centre in Ibrox Stadium, claimed that fellow members of staff had called him "Osama Bin Lipka", a "Mongol" and "Genghis Khan". The Return of Legalized Racial Profiling? Recently, the U.S. Court of Appeals for the First Circuit issued a series of decisions mimicking an odd dance. The end result? The first jury verdict in favor of the plaintiff in a post-9/11 airline racial profiling case against a company that was overturned. The outcome is devastating to all people who suffer discrimination and seek a remedy in court. However, the process by which this decision was reached may be even more disturbing than the outcome. In a decision issued on January 10, 2008, the three-judge panel that heard the appeal stated: "Race or ethnic origin of a passenger may, depending on context, be relevant information in the total mix of information raising concerns that transport of a passenger ‘might be' inimical to safety." This statement indicates that these three judges find it acceptable to consider a passenger's race in determining if he or she may travel on an airplane. This is a frightening legal ruling with enormous implications. Claims of racial discrimination are notoriously tough cases to win. Whether in a workplace, restaurant, or jury selection, a person in power who discriminates based on race can usually concoct a non-race-based reason to justify an otherwise racially discriminatory action. As Justice Thurgood Marshall wrote in a concurring opinion to the Supreme Court's most important decision concerning racial discrimination in jury selection: "Any prosecutor can easily assert facially [race] neutral reasons for striking a juror, and trial courts are ill equipped to second-guess those reasons." Plaintiffs bringing discrimination cases therefore face an uphill battle to convince a jury to look deep into the mind of the decision-maker and determine that the true reason, the motivating factor for the decision—be it firing, exclusion from a public place, or dismissing a juror—was race. After 9/11, public frenzy, fueled by media and the government, gave rise to widespread suspicions of people of Arab descent. As early as one week after the attacks, a New York Times commentator wrote that prior to 9/11, the idea that racial profiling was wrong was "so universally accepted that it had become the received wisdom." In the aftermath, the question became whether it was acceptable to "stereotype." The answer appeared to be yes, at least from reported experiences. Since then, "flying while Muslim" has become one description for post- 9/11 racial profiling on airlines, a play on the "driving while Black" description of police targeting African Americans for traffic stops. In this context post-9/11 racial discrimination claims, especially those pertaining to airlines, have seemed so daunting that few plaintiffs and plaintiffs' attorneys have chosen to litigate these cases. Because of the high security risk associated with airlines, instances of racial profiling—even when blatant—have seemed sure losers and were, indeed, frequently lost even before trial. Finally, lawyers at Public Citizen Litigation Group brought the case of Cerqueira v. American Airlines. The plaintiff, a man of Portuguese descent, suffered serious financial and emotional injury when, mistaken for "Middle Eastern," he was removed by the pilot from an American Airlines flight. An American Airlines administrator subsequently refused to rebook Cerqueira on a later flight. After a Boston jury awarded Cer- queira a six-figure verdict, civil liberties lawyers and racial profiling activists were given hope that anti-discrimination laws still had teeth to rectify the injustices perpetrated in the name of national security. Sadly, the victory did not last. In an appeal to the First Circuit, American Airlines attacked all aspects of the trial, including the jury's decision. The airline must have understood that it had far more at stake than this one verdict against it as reports of similar incidents had emerged all over the country and any indication that profiled individuals could successfully sue might subject American and others to extensive liability for violating their passengers' rights. American Airline's efforts were rewarded. As noted above, the First Circuit panel not only overturned the jury verdict, but took the unusual step of entering a final judgment in favor of American Airlines, rather than sending the case back for a new trial. It ruled that not only did the trial judge give an erroneous jury instruction that rendered the verdict invalid, but also that under the correct standard, no reasonable jury could find that either the pilot who kicked Cerqueira off the plane or the agent who denied him rebooking was motivated by race. This decision was, in part, rooted in the court's surprising conclusion that the customary test for determining if discrimination caused a plaintiff's injury—known as the McDon- nell Douglas burden-shifting analysis —doesn't apply in the airline context. Rather, a higher, even tougher standard for the plaintiff is at play, essentially requiring that plaintiffs present direct evidence of discriminatory animus; inferences and circumstantial evidence no longer have value. It is a rare case where direct evidence can be found. As if that was not bad enough, the three-judge panel went on to suggest that even if race had been a factor in the pilot's decision to remove Cerqueira, it could have been permissible. It was a gratuitous comment, unnecessary to support their decision. Indeed, Public Citizen, barred from retrying the case by the First Circuit's decision, filed a petition for rehearing by the entire court. "The panel's conclusion that racial profiling is a legitimate security measure is unprecedented," Public Citizen argued in its petition. On February 29, the full court denied the petition to rehear the case. The unusual nature of the case was exacerbated by two additional maneuvers. First, two of the five active judges on the court dissented from the decision to deny rehearing—a relatively rare occurrence. The dissenters were critical of the court's failure to review the three-judge panel's decision and of some particular aspects of the decision itself, but did not touch the single most objectionable comment—that using race as a factor to deny airline service to a passenger is permissible. Second, and most likely related, the original panel issued an "errata" to its opinion. Rather than correct a simple typographical or citation error, the court's "errata" eliminated the entire paragraph in which the panel included its offensive legalization of racial profiling. Though we can only speculate about the court's reason for issuing the errata—for instance, would there have been one more vote for rehearing had the paragraph stayed in the opinion?—we do know that this stealth move has two practical consequences. First, it puts this egregious throwback to legalized racism out of reach of legal challenges. Second, it effectively denies that the three-judge panel ever legalized racial profiling so explicitly. Because the change was issued in the form of an errata and not an amendment to the decision, no researcher looking for the case in its official published report will ever know that it was so altered. Though the court's errata was rescinded after for six weeks when it legalized racial profiling, the extremity of the three-judge panel's original statement cannot be ignored. The panel's remarks regarding the per- missibility of considering race as a factor in the airlines' safety calculus is reminiscent of the Supreme Court's statements upholding the constitutionality of Japanese internment during World War II. In the infamous 1944 decision, Korematsu v. United States, the Supreme Court explained that, "All legal restrictions which curtail the civil rights of a single racial group are immediately suspect. That is not to say that all such restrictions are unconstitutional. It is to say that courts must subject them to the most rigid scrutiny. Pressing public necessity may sometimes justify the existence of such restrictions; racial antagonism never can." Though Korematsu has long been condemned by legal scholars and courts alike, it has never actually been overruled. Thus, even today, the Supreme Court's decision to uphold the exclusion order that drove Korematsu from his home and to an "assembly center" remains the law, ruling that, "When under conditions of modern warfare our shores are threatened by hostile forces, the power to protect must be commensurate with the threatened danger." In their original decision last month, three judges of the First Circuit managed to align themselves, if only temporarily, with one of the most shameful moments in U.S. legal history. They made a bold and unnecessary statement ostensibly permitting race to be considered when determining if a passenger is "inimical" to airline safety. Although that statement was ultimately struck, there can be no doubt that it was not made accidentally. We can only conclude, therefore, that we find ourselves in a dangerous judicial climate, where such a ruling is only a vote or two away from becoming law. And yet, the First Circuit comforts us with its assurance that "[t]his case does not involve any claim of constitutional right on the part of the plaintiff...[r]ather, the case involves only the intersection of various statutes, which articulate competing policy concerns."